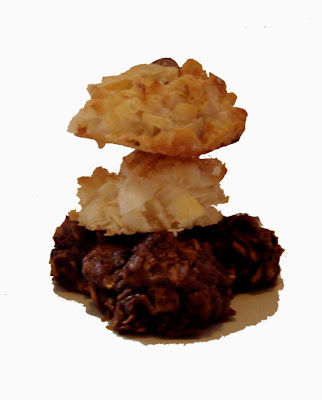 Bon Appétempt: A Trio of Macaroons: Happy Pesach! 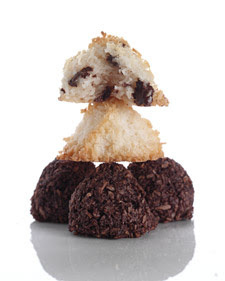 A Trio of Macaroons: Happy Pesach! So, I don't know about you guys, but I had a Martha Stewart weekend. First up was the trio of macaroons: plain, chocolate chunk, and chocolate. Now, I don't want to brag, but I think this might be my closest picture to date. Of course, you can be the judge. My one failing was that I couldn't get mine as tightly packed as Martha's. I believe the reasons behind this were twofold. 1. the recipe calls for you to run your hands under cold water before beginning to shape them with your hands and placing them on the baking sheet, but I only did that once, and what I realized by my 3rd batch was that you were supposed to do that each and every time you shaped them. But the last batch, where I rinsed my hands before each and every shaping, came out much better. You faked me out with the picture! Yours still look awesome. You faked me out for a second, and then I just thought you were actually trying to make us think those were yours, and THEN i thought, "Wow, she's really taking this blog seriously." I'm glad you came clean. Yeah, hers were more finely shredded. Plus I'm sure they did some sneaky stuff that you weren't privy too. Those look SO good! Is that a traditional Pesach thing? These look divine, Amerz. I bet you didn't know that I love macaroons. ;-) Can't wait to see the eggs edition. I like my macaroons just like i like my women...a little loose. These look good! My mom loves macaroons so they are my go to thrifty gift. I've found that you can make the nicest cookies with a flat spatula and a large non-wooden spoon. I slide the spatula at a 45 degree angle to gently shape loose piles into nice pyramids and use the spoon to mould others into ovals.